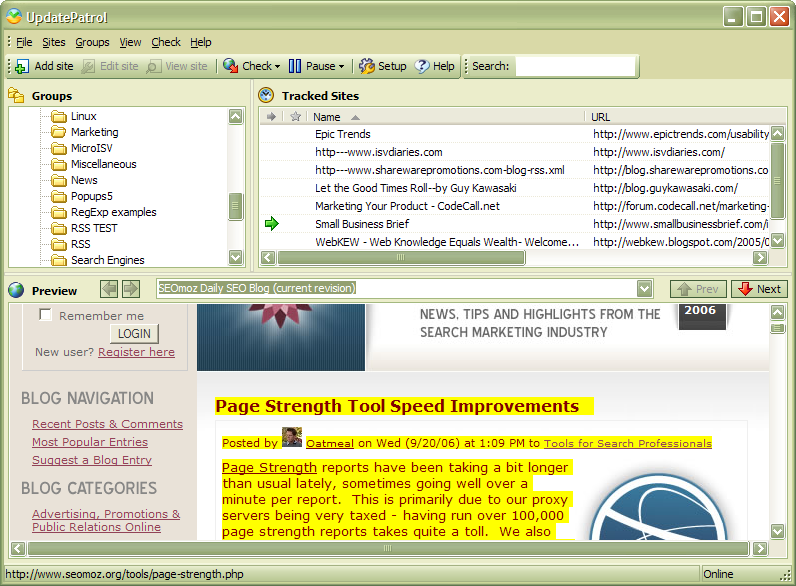 O in short: Silently watch web pages for updates ... Watch pages with changes highlighted in the built-in browser ... Receive alerts by email desktop popup or sound ... Check web pages for changes as often as you like .. Easily import your existing bookmarks. Silently watch web pages, blogs and text files for updates ... Watch pages with changes highlighted in the built-in browser ... Receive alerts by email, desktop popup or sound ... Check web pages for changes as often as you like .. Easily import your existing bookmarks ... Improves your productivity by working silently and unattended ... Dynamic content like page counters and dates can be ignored ... Web sites are listed in an Explorer-like tree structure like your bookmarks ... When monitoring blogs, all the important data formats (RSS, RDF, and Atom) are supported ... Whether you're a business person who needs to know about changes to your competitors' web sites, a student who needs to stay on top of a breaking news story, or a home user who wants to follow your favorite sports team or movie star, this program makes following hundreds of web sites and blogs as simple and fast as checking your email... EASY to use unlike our competitors ... NO monthly charges ... NO limit on the number of pages you can monitor. Completely free to try for 30 days, no strings attached.